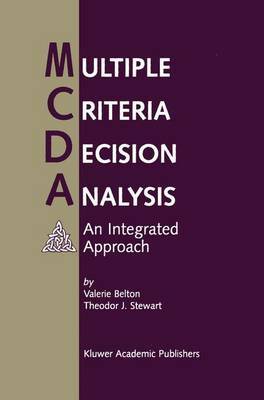 The field of multiple criteria decision analysis (MCDA), also termed multiple criteria decision aid, or multiple criteria decision making (MCDM), has developed rapidly over the past quarter century and in the process a number of divergent schools of thought have emerged. This can make it difficult for a new entrant into the field to develop a comprehensive appreciation of the range of tools and approaches which are available to assist decision makers in dealing with the ever-present difficulties of seeking compromise or consensus between conflicting inter- ests and goals, i.e. the "multiple criteria". The diversity of philosophies and models makes it equally difficult for potential users of MCDA, i.e. management scientists and/or decision makers facing problems involving conflicting goals, to gain a clear understanding of which methodologies are appropriate to their particular context. Our intention in writing this book has been to provide a compre- hensive yet widely accessible overview of the main streams of thought within MCDA. We aim to provide readers with sufficient awareness of the underlying philosophies and theories, understanding of the practi- cal details of the methods, and insight into practice to enable them to implement any of the approaches in an informed manner. As the title of the book indicates, our emphasis is on developing an integrated view of MCDA, which we perceive to incorporate both integration of differ- ent schools of thought within MCDA, and integration of MCDA with broader management theory, science and practice.